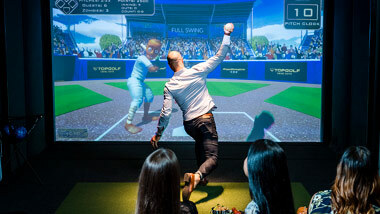 Experience a new way to play at the Topgolf Swing Suite at Hollywood Casino at Penn National Race Course. Immerse yourself in fun! 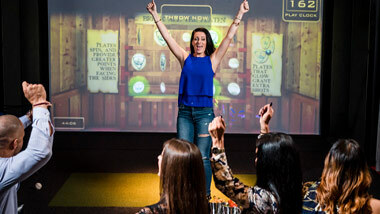 Experience the high-energy, interactive sport and social atmosphere that is changing the way people play. 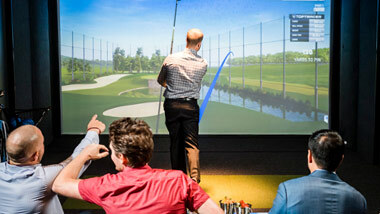 Whether you're planning a date night, celebrating with friends and family or just working on your swing, our luxurious Topgolf Swing Suite is ideal for any occasion. 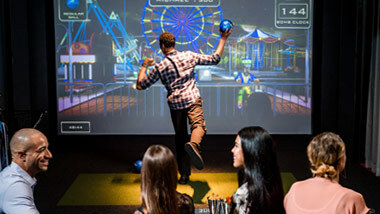 With its one-of-a-kind simulation that’s fun for everyone, you'll enjoy our spacious lounge area where you’ll eat, drink and take part in a variety of interactive games. 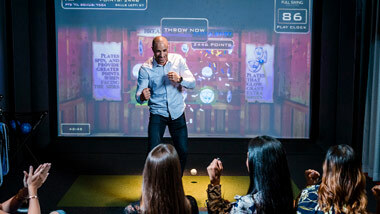 Featuring a massive screen and a selection of exciting virtual games, our Topgolf Swing Suite offers various multi-sport games. The Topgolf Swing Suite is located across from The Eatery. Reservations recommended. Our Topgolf Swing Suite is perfect for date night, special events, celebrations, company events or just to work on you swing. The Swing Suite has eight seats and can host up to 14 people. Take part in some friendly competition while enjoying a variety of great food and outstanding beverages – including mouth-watering burgers, pizza, craft beer, and specialty cocktails. For reservations, please call 717-469-3430 during operating hours or reserve online. • TopContender: Tracks shot accuracy while awarding players points for hitting targets. • The world's best golf courses: St. Andrews, Gleneagles, Torrey Pines and Pebble Beach. • Players must be 21 years or older. Enjoy a diverse sports betting experience that covers just about every game around at Hollywood’s new sportsbook. 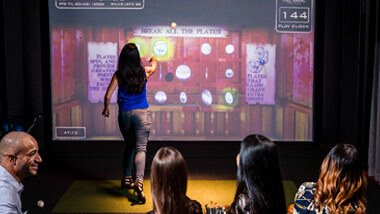 You’ll find viewing stations, lounge seating, odds-display monitors, and enough TVs to view all the top games. From Epic, an all-you-can-eat buffet, to Final Cut, one of the area's greatest fine dining steakhouses, to casual grab-and-go options at the new Eatery, you’ll find a variety of restaurants to choose from at Hollywood Casino. Central Pennsylvania’s premiere live music venue is located inside Hollywood Casino at Penn National Race Course just minutes away from Harrisburg and Hershey. The H Lounge is the place to catch all of the region’s hottest acts.